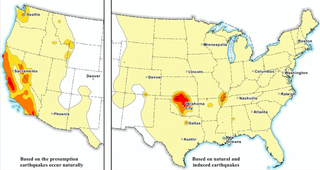 For the first time ever, the United States Geological Survey has published earthquake hazard maps that includes both human-induced as well as naturally occurring earthquakes. USGS maps had previously only featured natural earthquake hazards, but thanks to the alarming rise of man-made quakes, the scientific body has now started to track both kinds. Published on Monday, the maps identify potential activity in the central and eastern parts of the country and are accompanied by a detailed report. The writeup includes a number of eye-popping figures, including the conclusion that roughly seven million Americans live in places that are at risk for man-made earthquakes. Even more alarmingly, some of those regions are just as vulnerable to seismic activity as noted earthquake oasis California. The new maps are born from necessity: over the last six years, the middle of the country has experienced a “dramatic increase in seismicity.” Between 1973 and 2008, the average number of earthquakes of magnitude 3.0 or higher was 24 per year; between 2009 and 2015, that number skyrocketed to 318 per year. Thus far in 2016, there have been 226 such earthquakes in the central U.S. The most vulnerable states, from highest potential hazard to lowest, are Oklahoma, Kansas, Texas, Colorado, New Mexico, and Arkansas. The primary culprit, according to the USGS, is wastewater disposal from oil and gas operations. “While most injection wells are not associated with earthquakes, some other wells have been implicated in published scientific studies,” the agency said. While it may seem tempting to blame the increase in quakes on hydraulic fracturing, or fracking—the much-maligned but increasingly popular method of natural gas extraction—the USGS cautioned against jumping to such conclusions. According to Choy, while wastewater injections are at the heart of the induced earthquake increase, they’re not necessarily coming from fracking, but rather from an increase of oil and gas production more generally. “Most of the water does not come from fracking, it just comes from regular oil and gas,” Choy said. Still, the effects of fracking—seismic-related or not—are still being studied, and there’s certainly evidence out there to connect it to earthquakes. Interestingly, however, there’s some disagreement within the scientific community itself over the connection between fracking and earthquakes. On the bright side, we can all agree at least that humans are the goddamn worst, and now we have the maps to prove it.